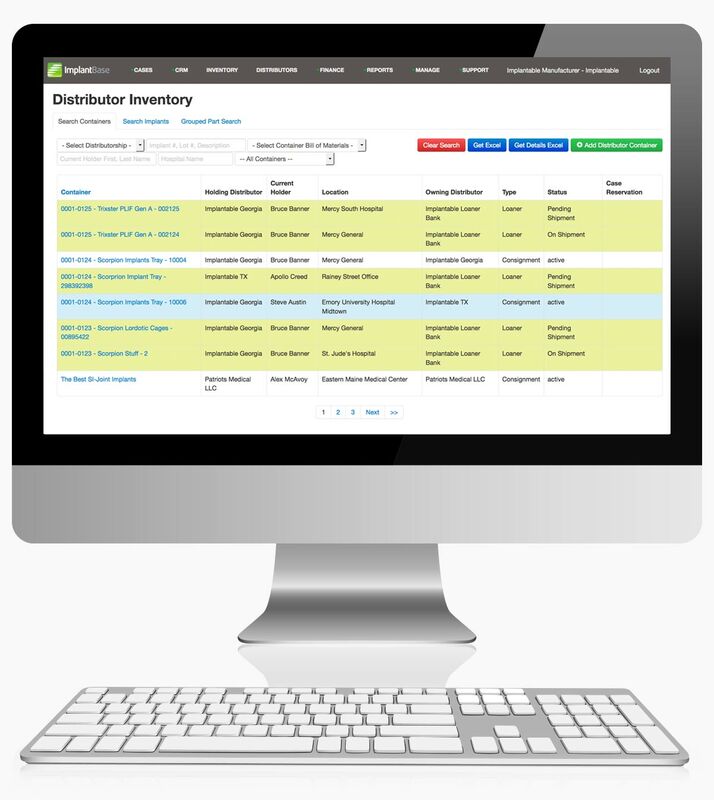 See all field inventory across distributor, rep, or product line. View field inventory, warehouse inventory, incoming returns, pending requests, approved requests awaiting fulfillment, items on backorder, and items in need of procurement. Search and access implant details, including all specs, activity and sales summary, location by part numbers, hospital pricing, and reorder usage. View implants that are expired or expiring soon. Manage submitted consignment, loaner, replenishment, and ad hoc inventory requests, or create them on behalf of reps in the field. Approve or deny, automate shipping, and automatically send shipment notifications via email. View and search inventory by container, by implant, lot and serial number. View expired/expiring inventory. View open requests, including current status, and view incoming shipments. Handle requests and fulfillment, analyze due and overdue inventory, set overdue fees, and extend due dates. Manage inventory via a single system. Use real-time visibility and data to inform workflows and processes that reduce chaos and allow you to deliver what is needed on time. 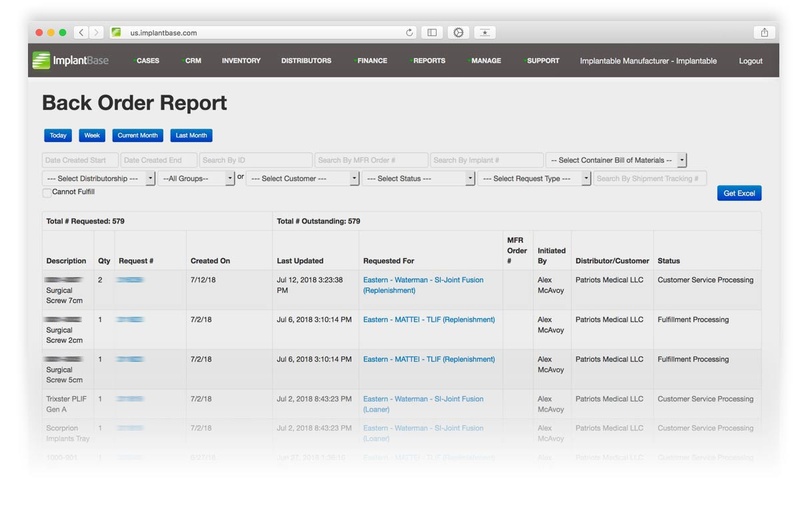 Access powerful reports, real-time insights, and comprehensive data to improve decision-making across your business. Comprehensive features to keep track of everything. Quickly determine who has what, where it is, when it's was last used, and when it scheduled to be used again. From ad hoc consignment requests to replenishment requests to loaner requests. Fast and easy data entry. Real-time access to request status. From consignment/loaner requests to direct orders and stock orders, one streamlined process for meeting demand. Real-time access to the shipment status. Configurable notifications that indicate the tracking number, what is on the shipment, and what is NOT on the shipment. Real-time tracking of loaner inventory, including due-back dates and overdue loaners listings. Manage loaner fee assessments, as well. Real-time listings of items requested but not fulfilled. Visible at both the manufacturer and distributor/sales rep level. Use barcodes to receive and move inventory. Includes UDI barcode management tools. Real-time tracking of expired and soon-to-expire items. Also automatic notifications to the field. Systematic blocks to prevent the usage or expired inventory. 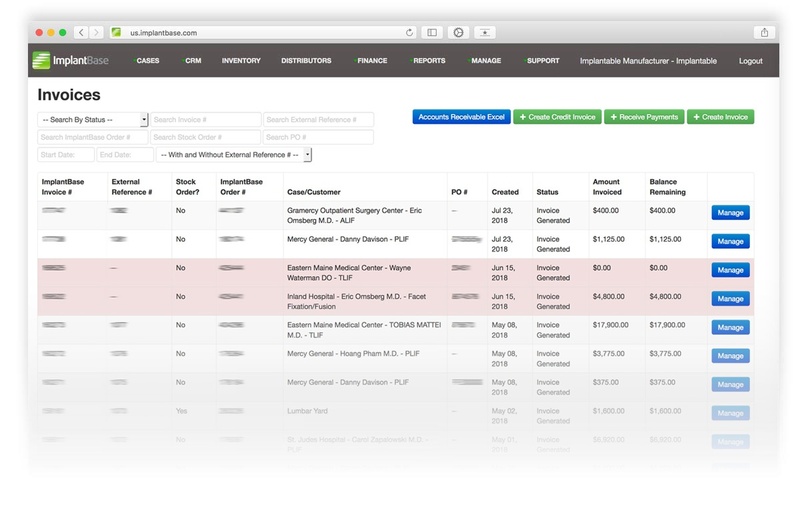 Analyze inventory utilization and inventory transactions in real-time. Easily investigate movements by part, lot, and/or serial number.